Definition at line 40 of file llfloatersaveavatar.h. Definition at line 53 of file llfloatersaveavatar.cpp. References llassert, mSingleton, and NULL. Definition at line 47 of file llfloatersaveavatar.cpp. Definition at line 94 of file llfloatersaveavatar.cpp. References gAgent, LLAgent::getAvatarObject(), gSavedSettings, LLControlGroup::setString(), and LLVOAvatar::writeCAL3D(). 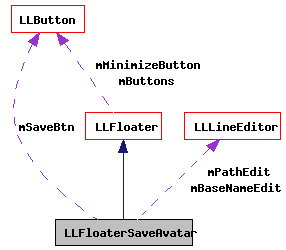 Definition at line 79 of file llfloatersaveavatar.cpp. References LLUICtrlFactory::getButtonByName(), LLUICtrlFactory::getLineEditorByName(), LLControlGroup::getString(), gSavedSettings, mBaseNameEdit, mPathEdit, mSaveBtn, onSave(), LLUICtrl::setCallbackUserData(), LLButton::setClickedCallback(), LLLineEditor::setText(), and TRUE. Definition at line 61 of file llfloatersaveavatar.cpp. 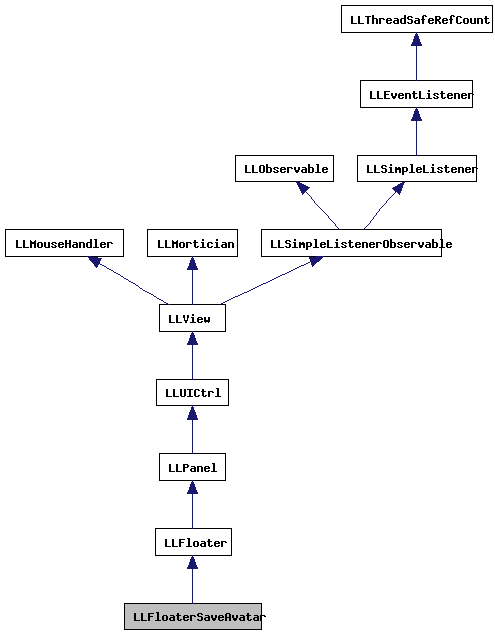 References LLUICtrlFactory::buildFloater(), LLRectBase< Type >::getHeight(), LLFloaterView::getNewFloaterPosition(), LLView::getRect(), gFloaterView, gUICtrlFactory, left, LLFloaterSaveAvatar(), mSingleton, LLFloater::open(), S32, LLView::setOrigin(), and top. Definition at line 53 of file llfloatersaveavatar.h. Definition at line 54 of file llfloatersaveavatar.h. Definition at line 55 of file llfloatersaveavatar.h.